In every writing class I’ve taken so far, right after the subject of editing is covered, someone always asks: how much editing is too much? How do you know when you’re finished editing and the piece is ready to submit? Usually a fascinating discussion ensues, because everyone has their own opinion. But I never felt like I left with a satisfying answer. Under-editing is usually my problem. I know there are perfectionists out there. I am not one of them. I suspect the real answer is something like this: when you know what you’re doing, you’ll know when the story is ready to submit. I still don’t know what I’m doing, but I submitted a short story to a speculative fiction market today anyway. Since I’m still trying to learn, I brought this story to the point where I think it’s ready through a long process of trial and error. The title has changed a couple times, but if you are one of the people I begged to critique it, you will recognize it as the “Alien and Bagpipes” story. The current title is “Earth Music” (about 1100 words). It started as a writing prompt from one of Cat Rambo’s classes, something like: “Describe an earth object from the point of view of an alien.” So obviously I chose to describe Highland bagpipes from the point of view of an octopus-like alien that lives underwater. But, a description isn’t a story. So I added background to explain why the alien had the bagpipes, and what he was planning to do with them. I thought the story was finished, and I submitted it too soon. Re-reading that “story” now, it is clear to me that not only did it need more editing, but it wasn’t complete. So after it was rejected the first time I added a conflict. I added an unhappy ending. I edited. I took out the extra adjectives and adverbs and did my best to make sure any remaining adverbs were pulling their own weight. I submitted to another market. By the time it was rejected, I had joined a critique group, who were kind enough to work-shop it. I got great feedback, and one writer suggested that I take the circumstances that led to the unhappy ending and “really go for it”. The story sat on the back burner for a couple months before I came back to it. I re-wrote it so that the entire story builds up to the ending. I asked for critiques and was lucky enough to get some extremely helpful input from a total of six people. This afternoon I convinced myself it was ready to submit. Again. If I had tentacles I’d be crossing them now. One added comment: Except for the photo of me on the “About” page, so far all of the photos on this blog were taken by me. For this particular post I tried to find an image of tentacles and bagpipes on the internet. I was shocked to discover there weren’t any. I had to resort to making my own. What’s up with that? Really, interwebs, you let me down this time! This entry was posted in Writing Path and tagged alien, bagpipes, editing, writing. Bookmark the permalink. Love your picture of the alien and the bagpipes. Can’t wait to read the latest story. Hi Miriah! 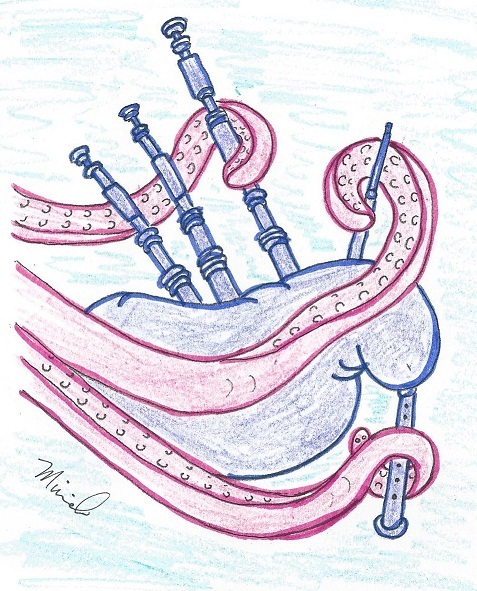 I love your blog, and the bagpipe drawing is fantastic! You are indeed talented! I’m following you now. See you tomorrow at the Feis!